The WordPress Reader is a feature that enables users to see blogs they follow and search for new blogs. These feature also allow your posts to be displayed for your followers. Sometimes, though a post will not be displayed. Note: If you do not see the reader when you click on the link above, please login to your WordPress Account. Mature sites or sites flagged as mature it will not show-up in the reader. 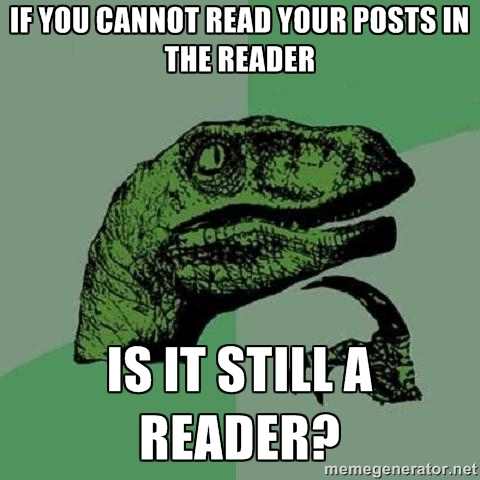 If you also publish a post and then go back and edit the date of publication it can impact the display in the reader. For example if you go to a previous published post and and forward-date the publication you can bring it towards the top of the reader list. Likewise, If you backdate it you can push it down the reader-list. Site Visibility: If you have not enabled your site to be searched by search engines it will prevent it from being displayed. Notice Site Visibility in Red. Be sure to enable it! If you expected a post to show-up in the reader using the scheduled a post feature, the post will not publish until someone has visited the site. If you want to get a scheduled post to publish you can logout of WordPress, navigate to your website, and re-fresh the page and it will automattically post. Note: The display in the reader may be impacted if you re-schedule a previous scheduled post by editing the date and time. By doing so it will change the permalink of the post (to the new post date) and will cause the post to jump in the reader along with impacting any links to the old dated post. If posts are marked private they will not display in the reader. WordPress suggests each post has no more than 15 Tags and/or Categories. Any more and your post runs the risk of being marked as SPAM and blocked from the reader. Note also: Suspicious Links or Affiliate Links from places like Amazon may result in posts being blocked or flagged from reader and therefore counted as SPAM. Use affiliate links sparingly. If your WordPress post is a brand new blog or does not have enough posts it may take several days or more before WordPress determines your blog is not SPAM. Reblogged posts do not show-up in the reader. Sometimes if you have a bad-link it will cause it not be shown on the reader. There have been occasions where you the tags you entered simply did not take. Try the following: Remove Post Tags–>Re-Enter Them–>Re-Publish blog. When in doubt, scroll-down. Other blogs you follow may have pushed it down the page. Your blog is set to a language other than English. You’ll need to use a different URL to find your post. Just change the ‘en’ in http://en.wordpress.com/tag/yourtag to the abbreviation of your language. For example: a German (de) tag page would become http://de.wordpress.com/tag/yourtag. Here you can find a list of languages we support on WordPress.com. If the above steps fail see here for Troubleshooting Missing WordPress Posts. Finally see here for Basic WordPress Troubleshooting options.